While it may be helpful to incorporate control variables into your research, they are generally not a main area of focus. They have an effect on the dependent variable, and by extension on the independent variable. If you omit control variables from your study, the results will be less accurate. This is particularly relevant if you’re planning to prove a particular cause-effect relationship by undertaking a statistical analysis. 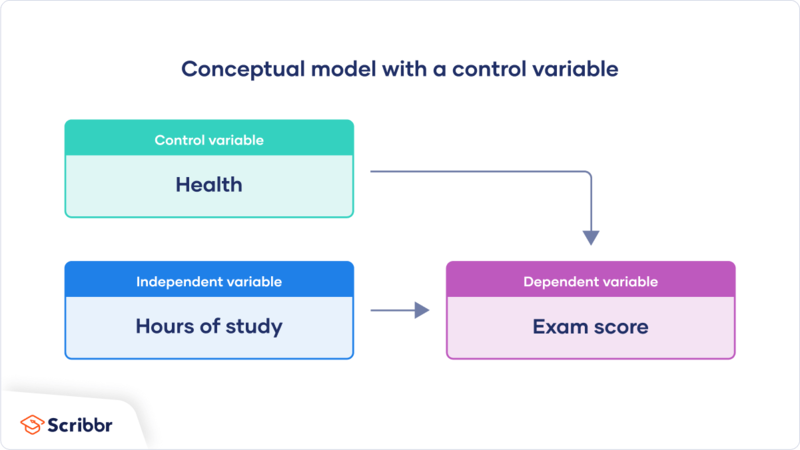 This is a continuation of an article that explained what independent and dependent variables are and what a conceptual framework should contain. The example we used in that article was the story of Ben, a student who put in many hours of studying (independent variable) in order to get a higher score on his exam (dependent variable). Now we’ll expand the original framework by adding a control variable. In our example of Ben and his exam, a control variable could be “health.” It could be argued that if Ben is feeling ill, he’ll get a lower score on his exam (i.e. health will influence the dependent variable). The below figure illustrates how the revised conceptual framework would look in this case. If you wanted to conduct a survey among students to demonstrate statistically that there is indeed a cause-effect relationship between “hours of study” and “exam score,” it would be wise to ask about each student’s health. If you did not, you wouldn’t be able to consider “health” as a control variable in your research – and it could be much harder to demonstrate the cause-effect relationship.